You've heard of yarn bombing (as evidence of its mainstream status, yarn bombing has even shown up in a Roche Bobois ad), but have you seen Lego bombing? Chinking? Mosaic? No, it's Lego bombing. Lego street art spotted in Warsaw, Poland. Via Street Art Utopia. An uneven stone wall is a fitting spot for Lego bombing. A crumbling corner is the perfect surface for a bit of Lego fortification. Via Karmadecay. Can you spot the Dispatchwork? It's subtle. 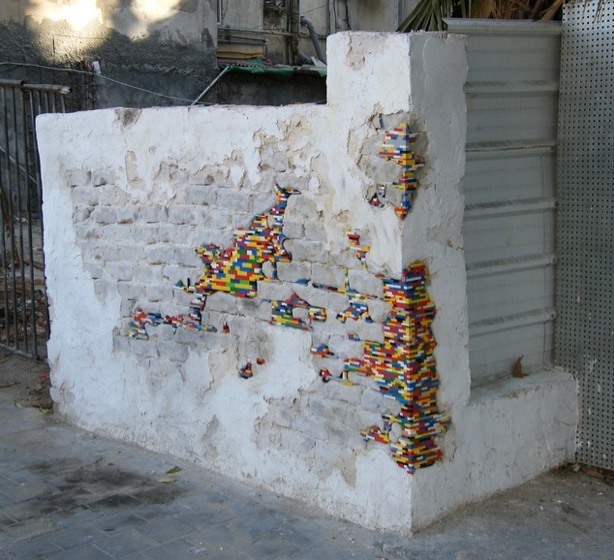 Surely Le Corbusier would approve of this colorful case of Lego bombing. Via Lazy Haze. Just another afternoon of local residents going about their business. Via Lazy Haze.